Water, obviously, is required and in the absence of rain your hosepipe will be on red alert. Use water wisely and only water plants that need water! Established trees and shrubs will be fine in the dry weather but baskets, containers and anything newly planted will need your help. And leave your lawn alone as, yes, it will turn beige but equally, yes, it will turn green when it rains again. Water the soil to get at the roots. None of this silly standing over a border spraying willy-nilly. No, no, no. Get down and dirty and drip water onto the soil surface where it can seep deep into the soil and actually reach the thirsty roots. Water deep. This encourages roots to delve into the soil and not hang about near the hotter surface. It’s the best thing for longevity of plants. Water early in the morning to allow plants to take up the water before the sun begins to evaporate it away. OK, not pre-dawn but early enough when it is cool. Get wise with your water. Automatic timers are great for freeing up your time to laze about and relax in the shade. Seep hoses are marvellous at getting water exactly where you need it (on the soil surface) without wasting a drop. 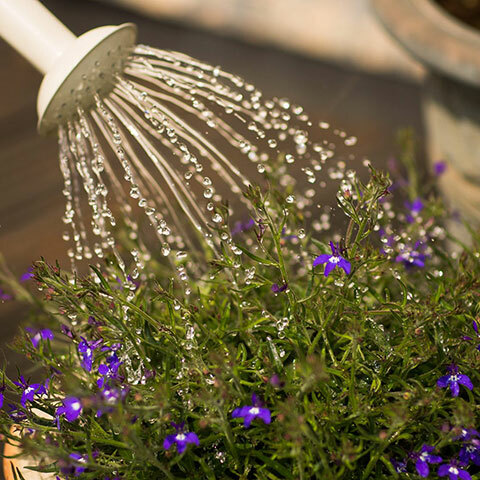 A lightweight watering can makes hanging basket watering a cinch. Make it easy on yourself and avoid massive frustrations by investing in an anti-kink hosepipe. I cannot even begin to tell you the number of times that I’ve been watering at one end of the garden for the hosepipe to become tangled – a kink stopping the flow resulting in me trekking down to unkink, etc. It will be the best thing you’ve ever invested in during a heatwave (other than comfy garden furniture and a parasol). That’s your plants sorted but what about you? It was years ago that the ‘Slip, Slop, Slap’ campaign was everywhere. It is even more relevant today. Slip on long sleeved clothing, slop on the sun cream and slap on a hat. And do take on water yourself (not from a seeper hose pipe or watering can) and stay out of the searing sun. Check out parasols to keep you shaded and new cushions to make that lounging about admiring your handiwork, or the weeds you promise to remove once the heat dies down, so much more enjoyable. Make the most of the summer - one like this doesn’t come along every year you know! Whilst we’re on the subject of glorious weather, please don’t forget that Buy Sheds Direct stock everything you require to make your garden the best possible place to be this summer.